The 8th September 2017 was a significant date for the shipping industry, as the IMO’s Ballast Water Management Convention (BWM) entered into force. While the majority of existing ships will have potentially up to five more years to retrofit compliant ballast water systems, following changes agreed by IMO in the summer as a response to shipowner concerns, the die is now cast, and almost all vessels trading internationally will have to fit BWM systems, if they have not done so already. An implementation timetable for the so called D-2 standard for existing ships has been agreed, based on the date of the ship’s International Oil Pollution Prevention Certificate (IOPPC) renewal survey, which must be undertaken at least every five years. So by 2022 almost all vessels will have had to be retrofitted. Many believe this is a sensible time window that will help avoid drydock capacity for retrofits becoming a significant bottleneck. The ballast water treatment industry was disappointed by the change in stance by IMO. But there is a sense that, after years of research and development, the rewards for investment in technology are now within reach for those companies that can demonstrate that they have approved systems that meet the requirements not just of the IMO, but of the US Coast Guard (USCG). The USCG has its own set of rules, and for vessels wanting to trade with North America, a green light from them is vital. Getting dual IMO and USCG approval is the basic starting point for market acceptance, and at present, only a handful of suppliers have achieved this. Most recently, US-based Ecochlor has announced that its patented ballast water treatment technology has received USCG Type Approval for systems capable of treating ballast flow rates from 500m3/hr to 16,200m3/hr, having already been validated by IMO. Ecochlor says it is committed to offering a more efficient retrofit experience, highlighting the small footprint of its system, which makes it extremely space efficient, even for larger capacities. 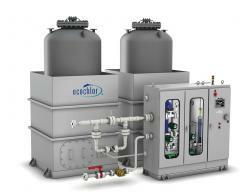 The Ecochlor BWMS offers a modular approach, providing further flexibility in tight spaces. Typically, only a single treatment system is required, with up to three chemical injection points connected to the vessel’s ballast lines. To add further flexibility as a retrofit option, Ecochlor has teamed up with Ballast Water Container (BWC) to offer a mobile containerised version of the system. BWC, based in Glasgow, Scotland, has developed a fresh approach to ballast water management compliance through mobile containerised BWMS that are suitable for retrofit applications. As well as working with Ecochlor, BWC has also linked up with Wärtsilä to deliver a containerised version of the Wärtsilä Aquarius AQ-250-UV BWMS. USCG Type Approval testing of the Wärtsilä system will now be carried out using this version of the AQ-250-UV. Also making rapid strides towards final USCG approval is the SeaCure Ballast Water Management System, an electrochlorination-based solution offered by Evoqua Water Technologies, which has now successfully completed all biological efficacy USCG Type Approval tests. The tests were carried out under the supervision of classification society Lloyd’s Register and the independent laboratory NSF International will now compile test data for submission to the USCG for approval. Evoqua says it anticipates receiving USCG Type Approval before the end of the calendar year. The SeaCure system is one of the smallest electrochlorination-based ballast water management systems to have completed USCG testing, with one unit capable of treating up to 6,000m3/h from an easy-to-install skid of just 2m x 1.5m. As such it is considered well-suited to retrofit scenarios. Alongside progress in the approvals process, there has been a steady upswing in the number of BWMS retrofits authorised by shipowners. In September, UK-based Coldharbour Marine announced that it has reached an agreement with Greece’s TMS Tankers to retrofit its GLD ballast water treatment system on the 2013-built 158,513dwt Suezmax tanker, Bordeira, in early 2018. In another recently confirmed project, Bocimar, a division of the Belgian shipping group, CMB, has signed an agreement with Envirocleanse - a company owned by Warren Buffet’s Berkshire Hathaway - to install its patented inTankTM BWTS aboard the Capesize bulker, Mineral New York. The initial installation will be designed as a pilot study and will include the treatment of a cargo hold being used in part as a ballast tank. Envirocleanse’s inTankTM is currently undergoing both land-based and shipboard testing for USCG aboard the USTS Golden Bear with DNV GL as the independent laboratory. Testing is expected to be completed by the end of November 2017 and applications for Type Approval submitted to both the USCG and IMO shortly afterwards. Established suppliers that already have IMO and USCG approvals are also continuing to upgrade and refine their technology with the refit market in mind. As an example, a third generation version of Alfa Laval PureBallast has just been announced and is claimed to minimise both footprint and installation costs.